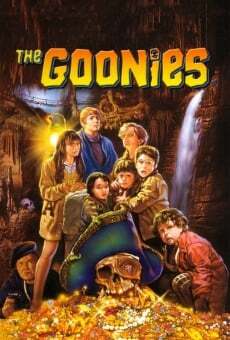 The Goonies, 在电影演員: Sean Astin, Josh Brolin, Jeff Cohen, Corey Feldman, Kerri Green, Martha Plimpton, Jonathan Ke Quan, John Matuszak, Robert Davi, Joe Pantoliano, Anne Ramsey, Lupe Ontiveros, Mary Ellen Trainor, Keith Walker, Curt Hanson 和 Steve Antin. Steven Spielberg 和 Chris Columbus. Harvey Bernhard, Frank Marshall, Richard Donner, Steven Spielberg 和 Kathleen Kennedy. Amblin Entertainment 和 Warner Bros..
Warner-Columbia, Audio Visual Enterprises, Warner Bros., Chapel Distribution, Warner Home Video, Roadshow Distributors, Warner Home Vídeo, Warner-Columbia Films, National Broadcasting Company (NBC) 和 Argentina Video Home.